‘I am not what you'd call wonderfully talented, but I am light on my feet and I do make the best of things’. Thus Gertrude Lawrence (1898–1952) described herself. Lawrence had that indefinable gift – star quality. Her early years were a struggle, but once she hit the big time in Charlot’s revue, in the 1920s, Lawrence was a star until her death in 1952. Everyone spoke of her greatness – from theatrical giants like John Gielgud, Laurence Olivier and Noël Coward, who wrote some of his best plays for her, to her devoted audiences. She could play anything from the elegant, emotionally shallow Amanda in 'Private Lives' to the third-rate variety performer in 'The Red Peppers' and Doris, the wife from hell, picking fish bones from her teeth in 'Fumed Oak'. Coward, who wrote these roles for her, said that she should be sent home after the first rehearsal and not allowed back until the opening night, so perfect was her instinct for a role. Lawrence triumphed in straight plays and musicals. She was a graceful and elegant dancer. She had a fascinating voice which she used with great allure and wit. That she easily went out of tune never bothered Cole Porter, George Gershwin, Kurt Weill or Richard Rodgers, who wrote some of their best songs for her. She married American Richard Aldridge and moved to Broadway where she played Eliza Dolittle in Shaw’s 'Pygmalion'. Her greatest success came when Rodgers and Hammerstein wrote Anna in The 'King and I' for her. Those fortunate enough to see her never forgot the scene where Lawrence, in the huge, billowing Irene Sharaff crinoline, taught the polka to Yul Brynner to the strains of ‘Shall We Dance’. But she knew she was dying. One night in 1952, she wrote in lipstick on her dressing-room mirror ‘Good Luck to the next Mrs Anna’. When she died, the lights on theatres in London’s West End and New York’s Broadway were dimmed in tribute. This caricature was drawn by actress Irene Wells while Gertrude Lawrence was appearing as Amanda in Noël Coward’s play Private Lives in 1930. 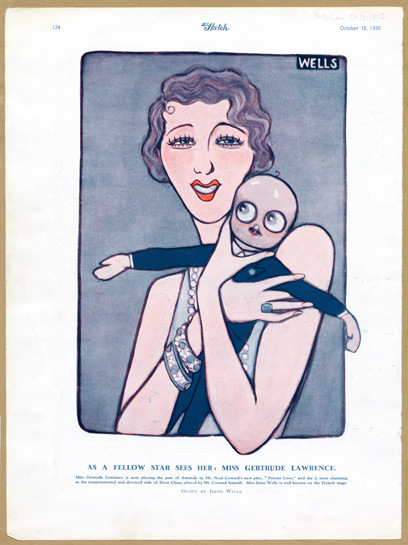 However, as the doll she holds looks nothing like Coward, who starred as Elyot, or Laurence Olivier, who played Amanda’s husband, Victor, the drawing probably relates to men in general becoming mere playthings in Lawrence’s hands. She was certainly one of the most stylish and captivating theatrical stars of her generation and the epitome of glamour. Private Lives made her a huge star and was a great hit for her and Coward as the divorced Elyot and Amanda, who meet again when honeymooning with their new partners. Lawrence’s success was so great that the public often confused her with Amanda and assumed that her private life was equally tempestuous. Cole Porter’s Nymph Errant opened at the Manchester Opera House in 1933 and the crowds were so huge that special police had to be drafted in to control them. 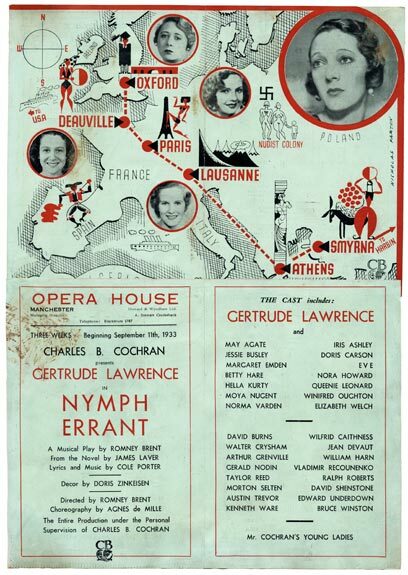 The audience included Noël Coward and Douglas Fairbanks Jnr, with whom Gertrude Lawrence was having an affair at the time. The show, based on a book by James Laver, a curator at the Victoria & Albert Museum, traced the heroine’s travels around the world while trying to lose her virginity. Gertie appeared in four of the shows six long scenes and closed the show exhorting everyone to ‘Experiment’ with life. Perhaps because the episodic nature of the plot made it more of a revue than a musical, reviews of the show were cautious. But no one had any doubts about Lawrence’s performance or that of Elisabeth Welch, who stopped the show with her rendering of Solomon. Their captivating performances can still be heard on recordings made at the time. 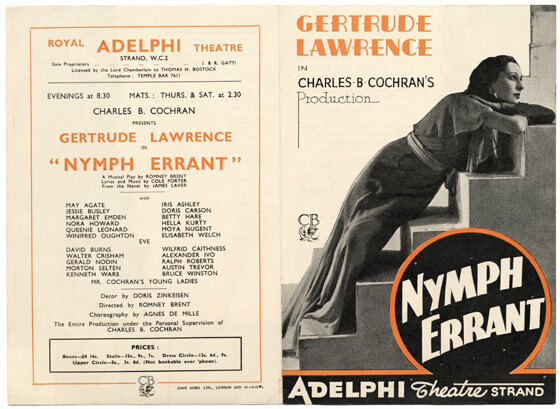 This is the programme for the London production of Cole Porter’s Nymph Errant produced by C.B.Cochran at the Adelphi theatre in the Strand. Gertrude Lawrence is on the front cover and other scenes from the production surround extracts from the reviews inside. Nymph Errant opened at the Manchester Opera House in 1933 and the crowds were so huge that special police had to be drafted in to control them. The audience included Noël Coward and Douglas Fairbanks Jnr, with whom Gertrude Lawrence was having an affair at the time. The show, based on a book by James Laver, a curator at the Victoria & Albert Museum, traced the heroine’s travels around the world while trying to lose her virginity. Gertie appeared in four of the show's six long scenes and closed the show exhorting everyone to ‘Experiment’ with life.